Juggle Jam 21 • May 17 & 18 at 7pm • Tickets are now on sale! JUGHEADS Youth Juggling Company is a unique program that develops creativity, fosters friendships, encourages goal setting and boosts confidence in youth from a variety of ages and backgrounds. And while all this is happening, kids become phenomenal jugglers! Paul Arneberg has been developing youth through juggling since 1994 when he started a small 10-member juggling club through a youth care program in Edina, Minnesota. 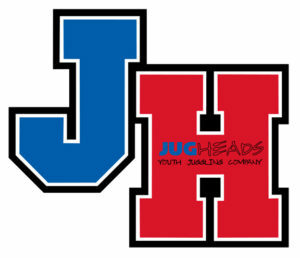 JUGHEADS membership now ranges from 90–120 youth jugglers. The heart of JUGHEADS lies in the long-term relationships that are built with and among youth through our after school clubs and summer camps. The average Jughead will stay in the program for 4-5 years, while the most invested can immerse for up to 11 years. JUGHEADS (JH) school year juggling clubs are the core of the company, offering an opportunity for youth to learn unique skills that combine both athleticism and artistry. Clubs encourage individual and group achievement with unlimited potential for growth in dexterity, confidence, and friendships. All JH Clubs and Camps are directed by Paul Arneberg with help from a Student Leadership Team along with coaches & specialists as needed. Since an average club size is 20-25 kids, this helps each Jughead receive more personal attention and instruction. Self direction is encouraged, as is juggling at home to make the most of juggling with many peers and instructors at once once a week! JUGHEADS is in its 3rd decade of summer juggling camps, offering instruction and mentorship to beginners through experts entering grades 3–12 (plus the summer after HS graduation). For 2018, our summer kicks off with two Mega All–Day Juggling Camps (June 11–12) designed for school-year Jughead members and experienced campers only. Thereafter, five weeks of half–day camps are offered. The morning sessions (9 pm–Noon) are geared toward beginning/intermediate jugglers, while the afternoon sessions (1 pm–4 pm prioritize advanced/expert jugglers (e.g., more self–directed and working on higher standards, routines, club passing patterns, etc. ).